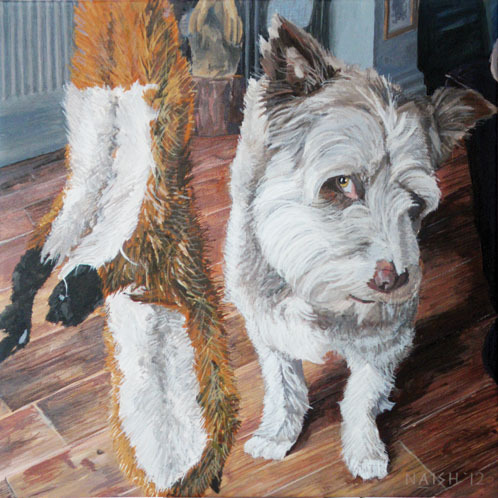 I often refer to this painting as Dog 2, but Rufus (the dog’s name) sounds a bit more benign. Besides, although the picture was begun second (of a series of 3) it was re-started on a new canvas after the completion of “Bailey”, making this Dog 3 instead. This is the first instance of starting again, and I ought to explain the circumstances of this. Somewhat besotted with the expression present on Rufus’s face in my source photo; I ploughed straight into this painting, ignoring many of the shortcomings present. I had addressed some issues in the background simplifying the brighter elements into a dark green mulch. I put the dog central in the composition (a rule for this series of paintings) and ultimately the green mulch became a bit empty. Realising all was not well I added Rufus’ ball. This additional plot meant to add balance just drew attention to the lack of detail in this region of the image. My uncle (owner of Rufus and he who commissioned the work) made a useful point on a preliminary visit with the two “completed” works and that was that the toy on the left only read as such if you knew what it was. Additionally I had a growing annoyance that the dog’s feet were cut off at the bottom of the painting – so I began again. Back doctoring the photo in photoshop, I managed to find some remarkably believable feet from alternative photos and I drew from an internet pet shop what the bottom part of the toy might look like. The background was straightened and dulled back and so it began anew. The other two pictures include a human element lacking in this. My wife suggested that the chair on the right would be better as a human leg. – I think this is a good idea – but it might have entailed starting over yet again - and this was too much for my poor little head; so I decided to leave it there. I hope you like the finished result – it was certainly a journey.